Isleworth Drawdock is a stretch of vertical river wall with regularly spaced piles and a riverbed suitable for taking the ground (for appropriate vessels), that is directly accessible by road. Isleworth is practically unlimited in the size of vessel it can accommodate. The Drawdock is available as either a full length or half-length berth (suitable for vessels up to 18m in length). 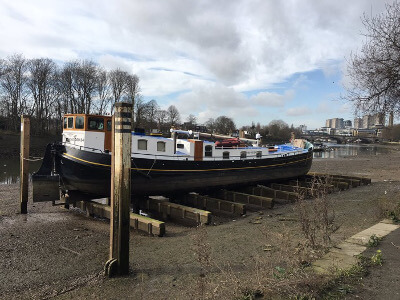 Vessels using one half of Isleworth Drawdock will be charged £25 per 24 hours or part thereof. Vessels wishing to use either the full length of the drawdock or who moor across the centre line dividing the berths will be charged £45 per 24 hours or part thereof. Strand-on-the-Green grid is a timber grid suitable for smaller vessels, but without road access. The grid is limited to flat bottomed vessels of 25m length, 9m beam and a displacement of 200 tons. There is a tide board on the upriver pile of the Grid and it should be noted that there are no direct shore access at this facility. All vessels, regardless of size, draught or displacement, will be charged £45 per 24 hours or part thereof to use Strand on the Green Grid. Those wishing to make use of these facilities must book them with the Harbour Service Upper crew who may be contacted 7 days a week between 0700 and 1700 on 07711 640 095. Should you wish to depart early they must be notified. There are no water or electricity or shore storage facilities at either site. It should be noted that the towpaths and roads adjacent to the two drying out facilities are liable to flooding. Further guidance can found at: https://flood-warning-information.service.gov.uk/warnings or via Floodline: 03459 88 11 88. All users are required by SOLAS Regulation 34 to carefully assess their proposed voyage taking into account all elements of their navigation – it is recommended for unpowered craft to use a licensed tug and Master. You will be required to sign an Undertaking, essentially the ‘Do and Don’ts’ of using these facilities prior to the booking being confirmed. This will be emailed to you by the crew of the Harbour Service when the initial booking has been made. Locations of each of our PLA Drying out facilities are shown below. You can also view our interactive map for more details about the facilities available on the River Thames.